Calculations maintain that the laws of physics should prevent Santa Claus from delivering all his gifts and that Santa would burn up in the atmosphere if he tried. The internet magazine, forskning.no, has put together a team of four top researchers to look into the case. The panel’s conclusion is clear: Santa can do the job and Christmas is saved! Every Christmas, calculations circulate that have been dubbed "The Physics of Santa Claus". The calculations cast doubt as to whether Santa Claus could possibly deliver gifts to all the world’s good children – and still remain within the laws of physics. To deliver gifts to all who deserve them, they assert, Santa would need to move so fast that he would vaporise due to air resistance, be torn to pieces by gravitational forces or suffer other terrible fates we wouldn’t wish for Santa Claus. Many fall for these calculations. Yes, there has even been one instance in which a vicar was criticised for using them to explain to small children that Santa does not exist. Luckily, some would say, the vicar has apologised to the traumatised children. Because, even though the physics of the calculations is apparently good, the reasoning rests on a completely wrong premise, namely that Santa Clause does not exist. Even small children understand that this premise is completely wrong! How will Santa Claus ensure that all the good children receive their presents and once again save Christmas? To clear up this important question, Internet magazine forskning.no has gathered four the country’s sharpest researchers: astrophysicist Knut Jørgen Røed Ødegaard, professor of physics Gaute Einevoll, professor of mathematics Nils Lid Hjort and Elf expert Ane Ohrvik. They’ve taken the job very seriously. If Santa Claus is to deliver all the gifts to all the good children, his sleigh must fly so fast that he would burn up due to air resistance. But it has already been documented that Santa has no problem climbing down a chimney with a fire burning below. So how does Santa solve the problem of heat? Oedegaard believes that Santa saves time, energy and air resistance by producing gifts out in space. A new snowboard or doll weights quite little when it is high above the earth. "Likewise, Santa Claus doesn’t travel in our four dimensions (remember that time is the fourth dimension), but makes use of some 11 dimensions. These dimensions make it quite easy to pick up gifts from his warehouse at the North Pole," emphasises Oedegaard, while Nils Lid Hjort and Gaute Einevoll feel that recent string-theory allows for the use of at least 26 dimensions. The more dimensions, the easier to deliver gifts. Santa Claus – A Threat to the Environment? "Even though Santa uses both the ion-shield and travels between dimensions, the problem of air resistance remains," allows astrophysicist Oedegaard. "There are so many more people now, and so many more good children, that there are more gifts and thus more air resistance. Therefore, it is natural to explain the warming up of the polar region with all the extra heat that is released. But this problem will solve itself over time, because if children are too good, then all the ice at the North Pole melt. Then there will be no more winter, and thus no more Christmas." Elf expert Ane Ohrvik believes we should turn it around. "Maybe Santa Clause should raise his standards?” she asks, and recommends a point system for naughty children. Santa has been receiving more and more mail every year, and for him to also send a “report card” could create a big postal problem, she points out. Nils Lid Hjort suggests that the bureaucracy can be cut back if every family reports on children’s behaviour direct to the local authorities. Another question is how Santa Claus knows how nice children are. Gaute Einevoll suggests that children’s winter caps can measure brain activity in order to read the infinitesimal magnetic fields that are generated by their thoughts. This information is then forwarded to Rudolf’s antlers, which of course act as an advanced antenna system. Ane Ohrvik points out that many Americans believe that Rudolf’s red nose is a very advanced navigation system and everyone knows the saying “Santa Claus sees you” – something some interpret to mean that Santa Claus has psychic abilities. In Nils Lid Hjort’s opinion, it suggests co-operation between Santa Claus and the defunct East-European secret police: STASI. "The STASI archives are still secret, and this is a clear indication that information about nice and naught children is there,” believes Hjort, who doesn’t rule out co-operation with local security services, which often have the latest information on whether a child is naughty or nice. Another apparent impossibility with Santa Claus are his reindeer, who don’t just plod along. Nils Lid Hjort doesn’t find it so strange that there are flying reindeer. "You find flying creatures everywhere, and dinosaurs are a good example, but now they have developed feathers and are birds. Therefore it is no great paradox that we have flying reindeer,” he believes. "Santa Claus of course uses vacuum energy. 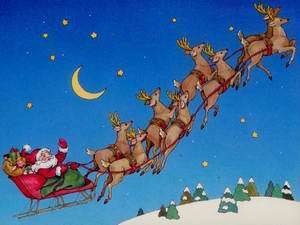 The sleigh and reindeer use repulsive energy to compensate for the force of gravity and therefore can fly." And with that, the conversation turns to a discussion whether Santa has chosen the North Pole because of its social, religious and political neutrality; multiple universes with a Santa in each; and so on. Papa With a Fake Beard? “This is the worst I have heard,” says Nils Lid Hjort. He is a professor and knows what he’s talking about. Although Hjort admits that a visit from Santa Claus often happens while pappa is out shovelling snow, there are many examples in which both Santa and pappa are in the same place at the same time, which weakens the argument that there is some connection between the two. "If I lived alone at the North Pole and were to visit children and their mothers, I would want to do it when their father was out, he says, and suggests that this is the source for the socially realistic popular song 'I Saw Mommy Kissing Santa Claus'." All together the panel the panel agrees without doubt that Santa Claus not only makes use of advanced physics, but he is also a brilliant organiser. "Santa lives at the North Pole and there isn’t so much happening aside from the occasional polar explorer. So he can use the whole year for self improvement,” points out Gaute Einevoll. Therefore, all children of all ages can relax: The laws of physics assure us that Christmas will come this year as usual!